skritswap is pleased to announce that Darren Redfern has joined the team as of January 2018. He brings a wealth of experience and we are lucky to have him on board as CTO. Darren has active been in the technology industry for thirty years, including many years at the executive level. For much of that time, he has been focused on the Information Retrieval (search) and Machine Learning areas for a variety of companies. Most recently, Darren served as VP of Research at IntelliResponse, where he designed and patented algorithms to make their question-answering technology work more accurately, efficiently, and in a scalable manner. Prior to that, Darren founded ThinkTank Technlologies which created the first natural-language search utility on the Web (eventually sold to Open Text). 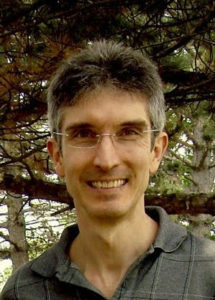 Prior to working in search, Darren’s focus was in symbolic computation – after graduating from Mathematics at UWaterloo, he became one of the original employees at Maplesoft and was also a Series Editor for Springer, the world’s largest technical publisher. Darren has four granted patents (US/Canada) and six books published. I have several – some would say, esoteric – hobbies. I love anything involving wordplay. From Scrabble to cryptic crosswords to bad puns, if it involves making words and bending language, I’m your man! A more recent passion has been cosmology. I’ve come up with some of my own “out-there” models around dark matter, dark energy, and the origins of our Universe. Also, I’m all over any games/sports that involve precision targeting – including darts, bowling, billiards, etc. I also love to sing (I’m a baritone), but I don’t do that as much as I’d like. Much of my career has been built on designing/inventing algorithms, and I’m really excited about the possibilities in automating the conversion of comprehension levels in documents. It represents a new angle on NLP/AI that both leverages my many years experience, but is also different enough to be a real challenge. Two things. First, Melissa’s enthusiasm, energy, and vision for what we’re doing was infectious. Second, I believe in the idea of making information available to everyone, regardless of their comprehension/reading levels. Much of my career has been in the search field in a similar way – improving access to information. I know this might sound completely nerdy (remember the “esoteric” comment above), but I’m an electoral systems wonk. I believe that the way we vote and the way that those votes are counted and translated to political power is *crucial* for well-functioning societies. Closer to home, I designed a federal voting system called Dual Member Proportional and served as the Green Party of Ontario’s Issue Advocate for Democratic Renewal during the Ontario electoral system referendum. I want to see skritswap as the de facto thought and technology leader in making information accessible to all. I think that’s possible within three years, even though such an ambitious goal will need to be improved on over many more years.